Andres Serrano’s Piss Christ has attracted controversy for more than two decades. 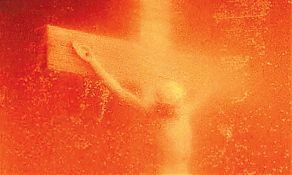 Piss Christ – a photograph that has attracted controversy for more than two decades – has gone on display in New York, at an exhibition which surveys 25 years of the artist Andres Serrano’s work. In 1989, the 60×40in red and yellow photograph of a crucifix plunged into a vat of Serrano’s urine ignited a congressional debate on US public arts funding; in France last year, it was physically attacked. In midtown Manhattan on Thursday night, a small group of Catholics opposed to the work gathered outside the Edward Tyler Nahem gallery, where the exhibition opened. Some Christians find the work deeply offensive. Anger towards the photograph hit a pinnacle on Palm Sunday 2011 when French Catholic fundamentalists attacked and destroyed the photograph with hammers. Serrano’s photograph of a meditating nun was also damaged in the attack. “The thing about the crucifix itself is that we treat it almost like a fashion accessory. When you see it, you’re not horrified by it at all, but what it represents is the crucifixion of a man,” Serrano told the Guardian. “And for Christ to have been crucified and laid on the cross for three days where he not only bled to death, he shat himself and he peed himself to death. The exhibition will be on display through 26 October at the private Edward Tyler Nahem gallery. Serrano’s next project includes a large book of photographs of Cuba, where his mother was raised.